Why Do We Have Pink Vehicles? Have you ever noticed our pink tiger-striped truck or van around town? These two vehicles aren’t just fun to see driving down the road, they are also raising money for cancer awareness in our area! Jeff Gamblin, the owner of Tiger Plumbing, Heating, Air Conditioning & Electrical Services says he wanted to do something to help out our community. So, a portion of the proceeds of each service call that we go to in one of these vehicles is donated to the American Cancer Society. To date, we have donated over $16,000 to the organization! The eye-catching vehicles are a big hit at local community events as well and will be on display at several Relay For Life events this summer. These two pink vehicles join a fleet of more than 45 tiger striped vehicles in the area. These trucks support more than 12,000 service calls each year. We know that almost everyone knows somebody that has been affected by cancer, and we wanted to do our part to help bring awareness to this disease. 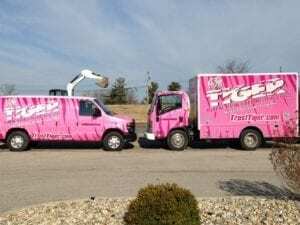 To request one of the pink vehicles to come out to your home for service, call 1-866-TIGER70 or visit TrustTiger.com today.